No. 15, Jalan Utama 2/30, Taman Perindustrian Puchong Utama, Seksyen 2, Batu 14, Jalan Puchong, 47140 Puchong, Selangor, Malaysia. We are professional designer and manufacturer all kinds of standard rollform machinery. The products are designed precisely by using computer-assisted technology with user-friendly features and state-of-the-art sophistication. YCE Engineering Sdn Bhd is one corporate name you can trust in the mechanical industry.State-of-the-art design. Super workmanship. High performance product. Prompt delivery. User friendly services. All under one roof. YCE Engineering Works Sdn Bhd is a trusted corporate name in the Roll Forming Machine Manufacturing industry. We are the manufacturer as well as the professional designer behind the state-of-the-art design of our machinery. Our well known product which is the roll forming machine is highly developed to provide user friendly and sophisticated features to the users. The machinery manufactured by us have gone through stringent quality control by adopting advance computer technology during the process. We highly emphasize on the quality of our products that we ensure great details on workmanship and prompt delivery. We are dedicated to deliver the highest quality products and services to our valued customers. 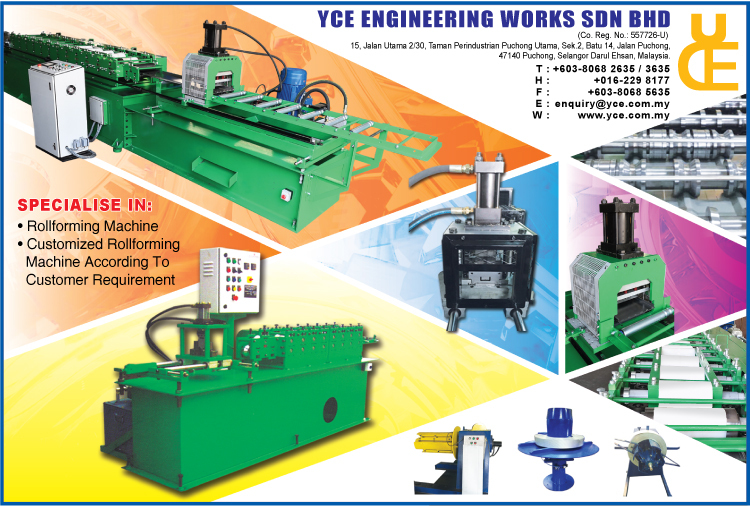 Think of YCE Engineering when you come to think of roll forming machine because we provide you with great satisfaction through our products.